What a cool story! 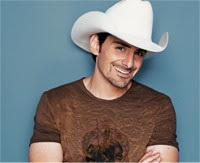 Brad Paisley granted the last wish of a dying man by taking one of most cherished possessions home with him. The man is Lee Feldman and he has terminal pancreatic cancer and he wanted to pass his custom-made guitar on to someone that will, as he says it, "play the frets off it." A few of Feldman's friends made some phone calls that led to Paisley meeting him at recent concert in Pennsylvania, where he accepted Lee's prized guitar. Feldman said, "He (Brad) told me that his grandfather had died from pancreatic cancer and that his grandfather was the one who taught him how to play guitar in the first place." Lee also stated that Paisley is planned on using the special guitar in a song on his next album. A story like this just goes to show how great country people are, right?